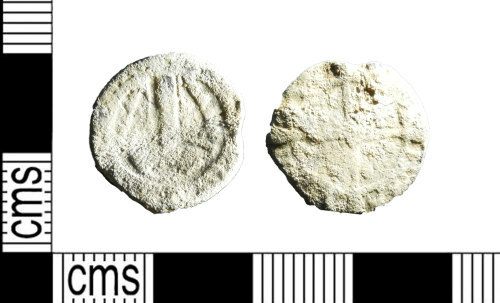 Medieval to post medieval lead alloy boy bishop token, 15mm in diameter with a weight of 2.12grams. The obverse depicts a mitre in a solid border with an inscription. The reverse has a long cross and pellets in each quarter with an incription mimicking a sterling penny. For similar examples see NMS-301C07 SF-FB8B37 WILT-ABF826.